To cook wholesome family meals, you really need a diverse rage of cookware and a section of pots and pans in which to create nutritious and imaginative dishes. When coking at home, one of the most loved materials in which to cook with, is stainless steel. As well as its beautiful shiny exterior, stainless steel is just a good all rounder, as it is tough, durable and works well on any kind of cooktop. One such cookware set is by Lodge. Below we offer you our full review of their 8 piece stainless steel and cast iron cookware set in silver. 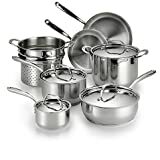 The following are the most features of Lodge Elements SC90SET 8-Piece Cookware Set, Silver. 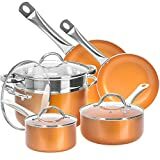 All of the pots and pans within the set, apart from the large skillet pan, have been made with marine grade stainless steel. This is the strongest stainless steel that you can buy and is incredibly durable. The pots ad pans have a high polish and are easily cleaned after use with warm soapy water. The stainless steel construction is also very safe to cook with as it is non toxic and will not react with any foods, especially those that are acidic in nature. The bases to all of the pots and pans have been made with multi clad layers. This adds weight to the pan and provides stability while cooking on the stove. The multi clad layering also ensures the thorough cooking of food, with no resulting hot spots. This makes cooking and eating that much safer. The stainless steel sides of the pan also allows food to be heated gently, yet thoroughly. Due to the multi clad layer, you also need less oil to heat the pan and this ensures healthier cooking. The cookware set comes with three glass tempered lids that are safe at high temperatures and are shatter proof. They are safe on temperature up to oven temperatures of 500 degrees F. As the lids are made of glass, they make viewing food while it cooks incredibly easy. Each lid fits its respective pan tightly, ensuring no loss of nutrients or steam during the cooking process. All of the pans also feature long looped handles, made from stainless steel, that are easy to hold away from the hot pan sides and are easy to grip and manipulate. 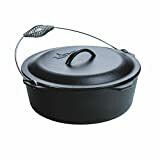 The cookware set features the following items: a 1.9 quart saucepan with matching lid; a 3.4 quart saucepan with matching lid; an 8 quart stockpot with matching lid; a 3,3 quart sauté pan and a 10 Inch pre seasoned cast iron skillet. Although only a small range of pans are in the set, they are incredibly diverse and allow you to cook a range of dishes on both the stove, oven and under a broiler. All the cookware is also safe to use on an induction hob. The set also comes with an iron skillet that is made from cast iron. The pan is pre seasoned and requires very little oil on which to cook. This ensures healthier cooking practices. It becomes very hot very quickly and is ideal for cooking meats and fish. The handle on this pan can become incredibly hot, but this is resolved by the use of a silicone mitt that is included in the set. This simply slips onto the handle to prevent you from burning your hand. Q. Does the deep skillet pan have a lid? A. The lid from the large stockpot fits the skillet pan perfectly. Q. Is this set safe for induction cooking? This 8 piece cookware set in silver by Lodge is a good buy. Although there are only four pans, they are incredibly versatile and made to a high quality standard. 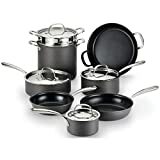 The set provides you with every pot and pan you will need for family cooking. It is easy to clean after use and is easy to manipulate on the cooker. It is incredibly hard wearing and will last for many years.